I love this look! Unfortunately, this look doesn’t love me….. 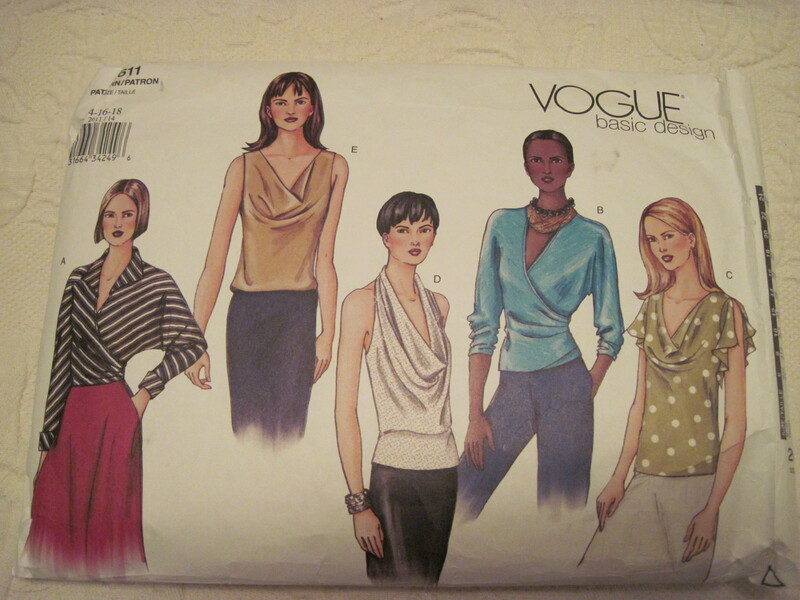 If, like me, you fell in love with this Vogue pattern 1452 (Today’s Fit line, designed by Sandra Betzina) here’s a bit of unsolicited advice: read some reviews (especially one by twistedangel) and make the necessary adjustments. Then, and only then, feel free to jump in and make this top! The actual sewing is not difficult; it’s the fit. I cut out the pattern tissue in size E, because I match the body measurements as printed on the envelope. The recommended fabric is moderate stretch knit. Not wanting to buy more fabric, I used a stretchier matte jersey from my fabric stash. Then I read the finished garment measurements on the front pattern piece. The negative ease as printed, was 5 inches at the bust. I scratch my head. Sounded like a LOT of negative ease for a moderate stretch knit, but the pattern does say it is close fitting. And, I was using a stretch knit rather than a moderate stretch. I assumed I should be OK. (Don’t ever assume). Then, I read a couple of reviews on patternreview.com. Yikes! Back up! The reviewer twistedangel writes about how using the pattern as is will be disastrous, mainly due to that much negative ease. Since the pattern tissue was cut out, and not the actual fabric, I made the decision to add ½” to each side seam while cutting the fabric. That should give me 2 whole inches all around, especially around the middle, where it was needed. However, in a serious senior citizen moment, I cut out the fabric exactly according to the pattern piece (without the intended ½” on each side seam). Now what? 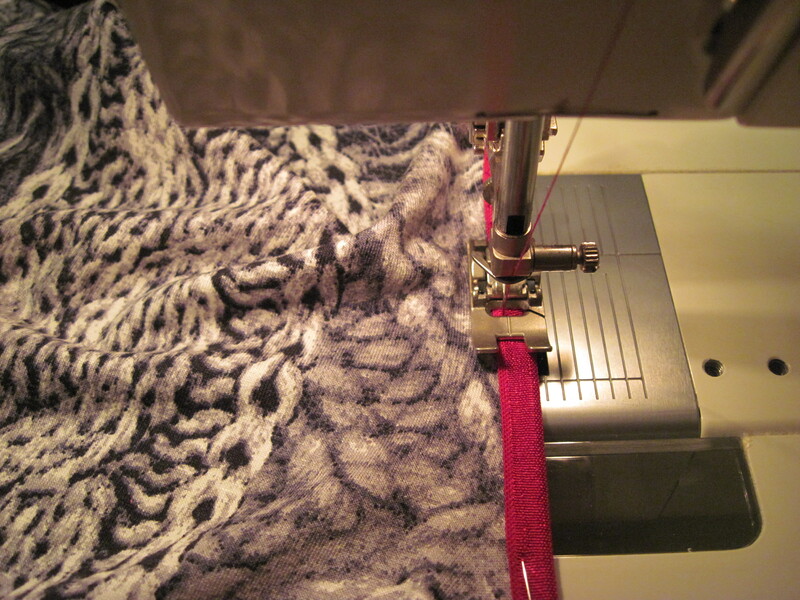 Well, I sewed all vertical construction in ¼” seams! The top was completed and looked pretty good! On the mannequin, that is. Which is my size. (we’re just distributed differently 🙂 ). But on me? The sausage like effect (to use twistedangel’s words) is quite pronounced. By the way, here is her review on her own blog. Actually, it looks pretty good on her. If you’re planning to make this item, do as twistedangel recommends; cut out this pattern a size or two larger. Also, I think the upper half of the tunic looks best when snug. Heh, managed to complicate things even more, didn’t I? Lesson: Negative ease on a moderate stretch should never be that much. My trusty book on drafting knit patterns says moderate stretch knits should have a negative ease of 2%. If I had used a recommended moderate stretch knit, the negative ease for size E should be less than 1”. For stretchy knits which was my choice, the recommended negative ease is 3% which amounts to 1.25”. 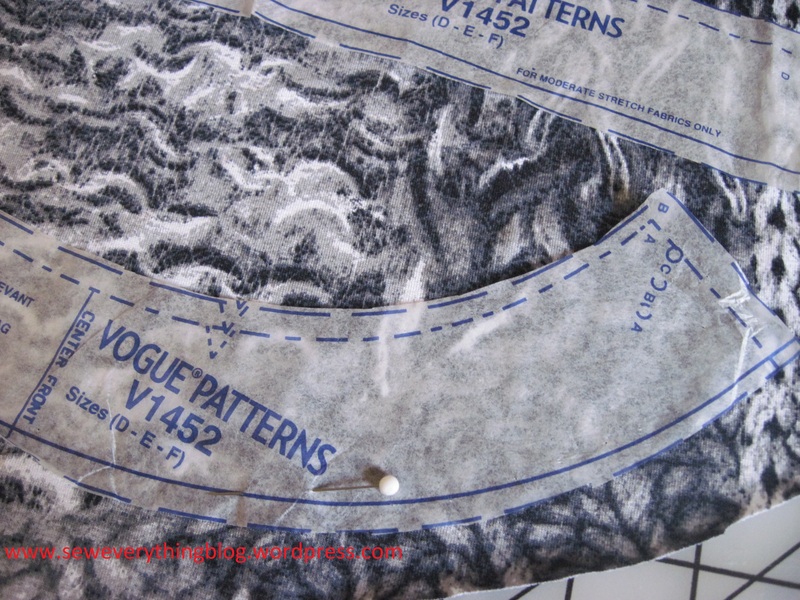 To continue picking on Vogue1452, be aware that some markings on the facing pattern piece #5 for size E were not proof-read. See below? The pattern piece is for size D-E-F but the line and dot markings say A-B-C.
Vogue Patterns, I really don’t mean to pick on you, nor do I want to exercise my innate meanness. 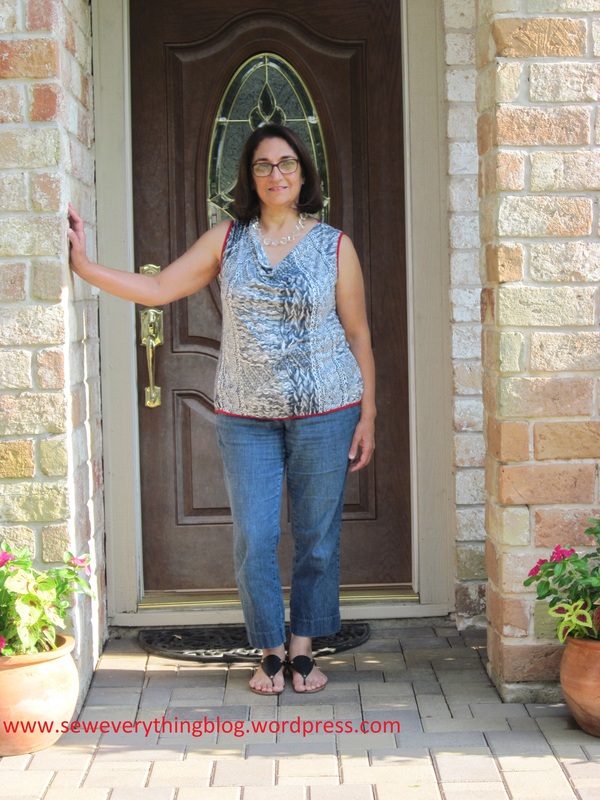 But I’ve been saddled with an erroneously drafted pattern before…..
With all the tunic drama, I did not pay attention to the pants; the reviews, though, are positive. As consolation, and in the spirit of moving on, I’m making an oft-used pattern to make this cowl top (View E) in the leftover jersey. It’s a digital print, and I love it. As long as I have my go-to cowl tops to wear, I’m good. You’re seeing me applying elastic foldover braid in the photo below. That’s how this August sewing story ended. Your turn! 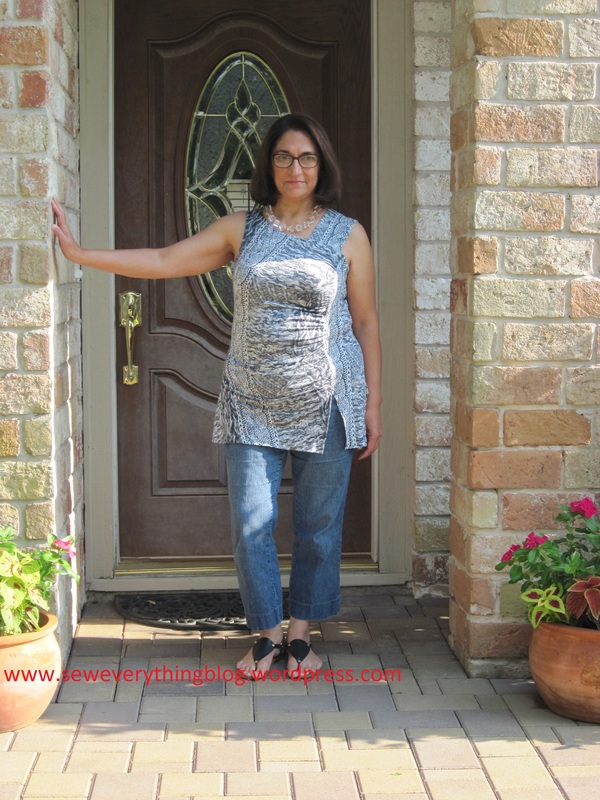 What are you sewing in the two weeks left in August? Getting the sizing right is the hardest part of sewing! Wow – a lot of frustration with that pattern. I like the trim and the neckline on the second top. 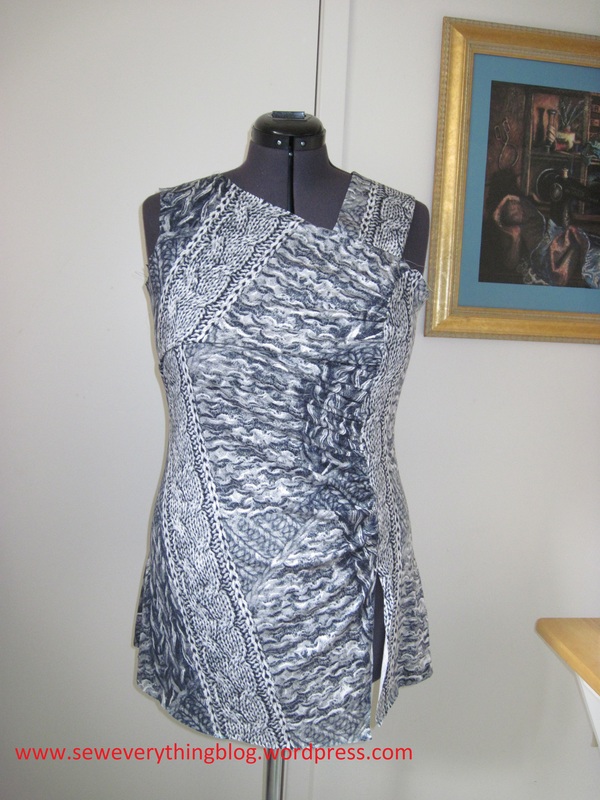 I’ve been working on altering woven cottons – for me, they are the coolest and most comfortable in the hot weather. Previous Post Its August. Bare Your Arms.